A Brantford Hydraulics filtercart is a flexible and useful piece of equipment in your lube and hydraulic oil management program. Our filtercart is a durable, portable, off-line filtering and transferring system. It's available configurations lend itself to your personal application. Our cart's pump combinations are suitable for small or large tasks. 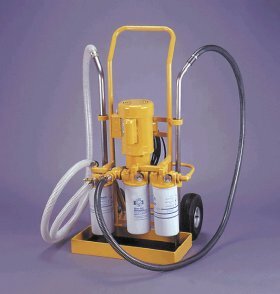 A Brantford Hydraulics filtercart is the ideal way to transfer new and existing oils to and from reservoirs and drums. Fluids that are being put into use on hydraulic systems or gear boxes, even though they are new, may not necessarily be "clean". Visually they may look "clean" but even the eye cannot see the particles that are detrimental to the mechanical parts or pumps life. Contaminants, both water and particulate (Dirt) can be introduced into the oils during processing, storage and handling. The flexibility of our filters allows you to configure the type of filtering you would like to accomplish. The types of filtration available range from water removal, straining, absolute fine filtration, and or simple transferring. The filtercart is also a helpful tool for in-house oil recycling, working in conjunction with our oil sampling service you can save substantial downtime and excess oil costs by treating your own oil to off-line filtering. If your company does not have a oil recycling program in place or you don't produce waste oil to warrant using a expensive mobile truck, this is the option for you. Air filled tires for ease of mobility around your factory, or out of doors. Filter elements are located at the lowest point of the filtercart, above the drip tray, so changing elements does not involve wiping down the motor and pump every time. A suction line strainer is always utilized to protect the pump and pre-strain the oil. A multitude of discharge filters are available to provide many different levels of fluid conditioning for different types of oils. A discharge side filter by-pass can be added for "looping-out" the filter/s for general fluid transfers. Saves using the filters unnecessarily. Three pump sizes are available to suit you application. A long, oil resistant electrical cord is supplied. Visual filter indicators are standard to provide monitoring of your filter/s condition. Suction and discharge hoses are identifiable to eliminate the confusion of installing your filter elements. Thermal overload protection is standard on all motor horsepower sizes. FC-5 0.5 110/230 1PH 8.8/4.4 Amps. 150 PSIG 127 lbs. FC-10 1.0 110/230 1PH 14.0/7.0 Amps. 150 PSIG 130 lbs. FC-15 1.5 110/230 1PH 17.2/8.6 Amps. 150 PSIG 133 lbs. *Note: All filltercarts are suitable for 15A service, under normal transferring application. Heavy-duty applications, i.e. system flushing, where maximum pressure maybe required, use a 20 Amp 110 VAC circuit.